You’ve got to work with what the particular client brings you! 1) You are probably not qualified to give diet or medical advice! I’ve known a number of hypnotists who recommend a particular brand of supplements or a particular diet or exercise program. Unless you have credentials in that particular area, I dont think that’s a good idea. When people come to you as a professional, you have a different legal standing than if your buddy asks you what he should eat. In my opinion, you’re on shaky legal ground if you recommend anything out of your area of professional expertise. Even if you have expertise in that area, there are potential legal consequences of advice–especially if you benefit financially from them taking your advice! Keep in mind, I’m not a lawyer myself and nothing in this post should be considered legal advice. 2) It’s good to figure out what is driving a weight problem. I like to have the client keep a food diary where they keep track of what they eat, when they eat it and how they feel as they make the decision to eat. A week’s worth will do. With the food diary you can more easily uncover patterns. Do they snack late at night? Is there a particular feeling that tends to drive unnecessary eating? If there is, you can deal with that feeling using any of several therapy techniques (time lines, straight regression, affect bridge, parts therapy, anchor collapse, re-imprinting etc.). Some folks simply have never learned to tell the difference between an emotional urge to eat and a physiological reason. It can be a good idea to have a client check in with themselves when they feel the need to eat. Is it a physiological hunger or an emotional one? The NLP “naturally slender eating strategy” is a great strategy for building that skill and building good choices in when they do need to eat. There’s a theory going around that one reason people eat more than they need to is because historically, it’s best to pack on a little extra in case lean times are coming. If you lived on the plains 10,000 years ago and had the opportunity to eat a bunch, it might be better for your survival to have some extra fat on you. After all, who knew when your next meal might be coming? Nowadays many of us don’t have to deal with the potential unavailabilty of food. Right now for instance, I’m within easy walking distance of two restaurants. The problem comes when there’s an old, instinctual drive to eat more but we have food easily accessible. That’s a recipe for being overweight. One approach is to explain that as long as food is plentiful, it’s better for your survival to eat just what your body needs. You can explain in trance and out. Suggest that they be satisfied with the amount of food that will meet their physical needs until their next meal. In a study of 60 women separated into hypnosis versus non-hypnosis groups, the groups using hypnosis lost an average of 17 pounds, while the non-hypnosis group lost an average of .5 pounds (Cochrane, Gordon; Friesen, J. (1986). Hypnotherapy in weight loss treatment. Journal of Consulting and Clinical Psychology, 54, 489-492). Adding hypnosis to other weight loss methods increased weight loss by an average of 97% during treatment, and increased the effectiveness post treatment by over 146%. Hypnosis continues to enhance weight loss results and the effect may grow stronger over time. (Kirsch, Irving (1996). Hypnotic enhancement of cognitive-behavioral weight loss treatments–Another meta-reanalysis. Journal of Consulting and Clinical Psychology, 64 (3), 517-519). 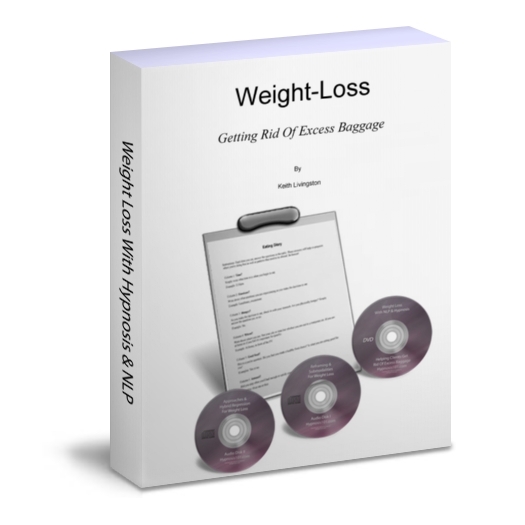 PS: If you’d like to learn how I approach helping people lose their “excess baggage,” using NLP and hypnosis, check this out.